The FingerTec Device Info tool is designed to link up your FingerTec devices for reading its vital information. This information is important for the support team to know before best assisting you. Read more for the download link and instructions on using the tool. 1. Unzip DevInfo.zip to become Dev Info.exe. You can download DevInfo.zip here. 2. Double-click on Dev Info.exe to run the tool. 3. Now, insert the IP address of your device. Click the IP checkbox to indicate you are connecting to the device via LAN (local area network). If your device is connecting to PC via USB (currently, only TA300 supports this feature), ignore the IP address column. Click the USB checkbox. If your device is installed at a remote site and is connecting to PC via DDNS method, insert the DDNS name at the IP address column. Click the URL checkbox. 4. Click Connect to link up the device. This is the serial number of the device. Always take this as the correct serial number if you notice the sticker is printed with a different serial number. You cannot update firmware if this section does not display FingerTec. If so, the core board might be empty and requires our support team to fix it. The firmware version installed on this device. Always provide this to the support team when you are reporting a hardware failure. The core board version installed on this device. Always refer to this if you are claiming warranty for the core board. 1 indicates you've already enabled the Work Code function in this device. 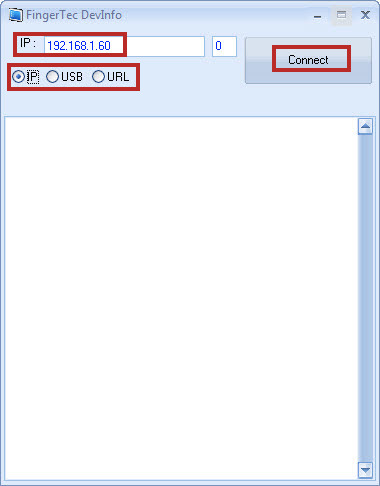 1 indicates the device encrypts data while writing into USB flash disk. 0 indicates this function is disabled. You cannot import data from USB flash disk into TCMS V2 or Ingress if it is not encrypted. 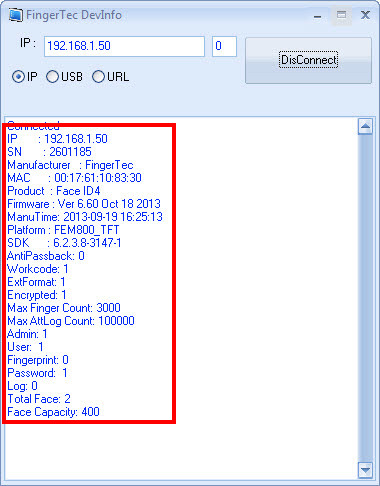 1 indicates your device is outputting encrypted Wiegand data for use with AdapTec Plus. 0 indicates this function is disabled. Refer http://www.fingertec.com/customer/download/postsales/HUM-ikioskp-E.pdf at page 12 - 15 for more detail to enroll administrator. After enrolling an administrator, the main menu can only be accessed by the administrator. Hi I get an error, SDK error. Class not registered while running this tool. Please run Device Info tools in the PC installed with TCMSv2 Software. I installed more than one device on the same software(TCMS V2), but I could not change the device ID (TA 500) number please help me as soon as. Hello, I come by this post asking how to make full reset of the device TA100TC with an admin that we do not know? In case you did not connect the device to the software, please contact your reseller, as they will help you to reset the administrator privilege at the terminal, because only authorized resellers have the authority to reset the administrator privilege at the terminal. Referring to your query, please note that for TA500 which is a colour screen model, you need to use Color Screen Model Function Demo in Biobridge SDK Demo. If you're using your own programming please make sure that you add "SSR_" prefix in front of the code. With regards to your query, we only have this tools with the current format. If you wish to have the c# format, you need to use our SDK demo which you can have a different type of format to use with your device. Hi FingerTec Technical Team, This is Mr. Donatien and I bought TA500 device. I would like you to help me on how to get a staff(Finger ID) who swipes on the device and the time that operation is done. I would like to allow my client to view reports via their existing localhost PHP application connected to MySQL database. May you help me for API or SDK to use please? Thank you! Regarding your query, please be informed that our FingerTec devices are bundled with FingerTec software including TCSM v2, TCMS v3 and Ingress. Please be informed that we do not provide direct support in any integration with third party software. i am a installer and having ta500, and this device we used a standby , we forgot the user name and password, and ip address .how we can reset the device. With regards to your query, please send us an email to support@fingertec.com as this is confidential to bypass device since only Fingertec authorized reseller can do it. You may state your company name and also device serial number in the email for our reference.